Easy-to-make spicy fish tacos with pan-fried white fish, slaw, and chipotle mayo. 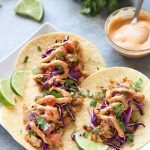 A healthier alternative to fried fish tacos ready in just 15 minutes! A few years ago, there was a Mexican restaurant in Miami that had the BEST estilo baja tacos! Beer-battered deep fried fish, Mexican slaw, and chipotle aioli. So bummed. But hey, that just means I had to learn to make them at home in a WAY healthier way. Because as you know, I HATE frying at home. If you’ve been a reader for a while (thank you! ), I’m sure you’ve read about my hatred for frying here and pretty much everywhere on the blog. These spicy fish tacos are BOMB. If I do say so myself. They are tender, flavorful, juicy and the creamy, spicy chipotle mayo just makes them extra DELISH! I mean, who doesn’t love a kick in their tacos?! If you want more chipotle mayo, by all means, help yourself! Best part of this recipe? Uh, everything. Duh. No wait, there’s more! It all comes together in just 15 minutes! Make chipotle mayo using the recipe in notes. 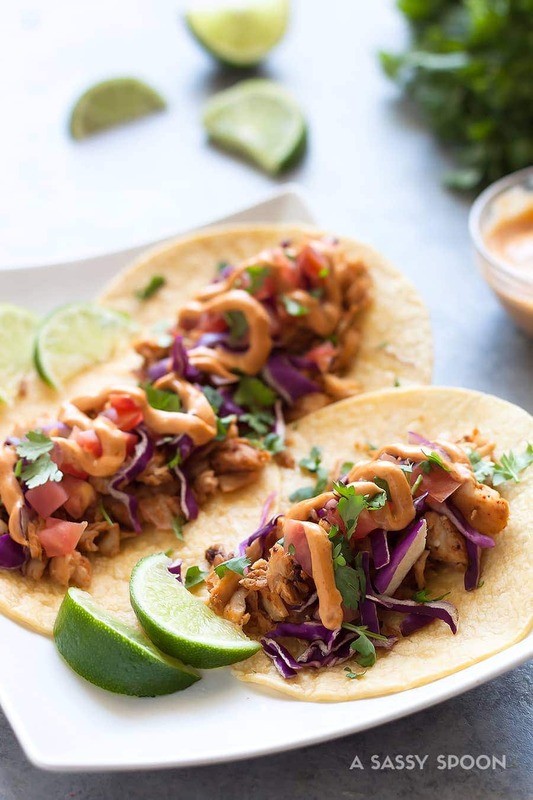 If using store-bought chipotle mayo, mix two tablespoons of the chipotle mayo with 1 tablespoon of lime juice to slightly thin it out for drizzling over tacos. Using a fork, shred the fish fillets. 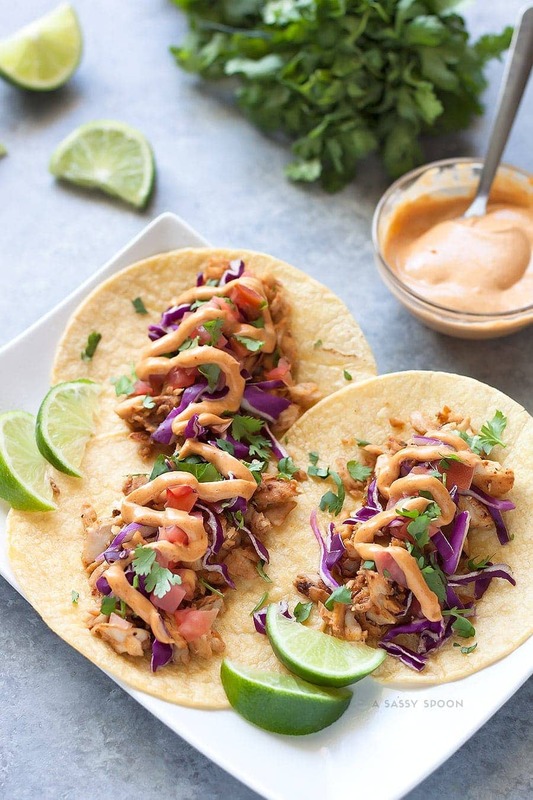 Divide into 12 corn tortillas, top with red cabbage, tomato, cilantro, and chipotle mayo. Serve and enjoy! 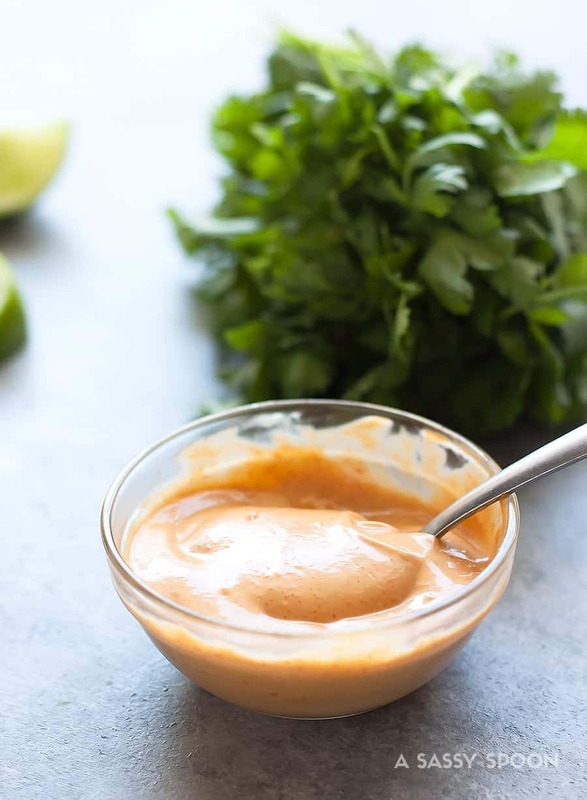 Easy Homemade Chipotle Mayo recipe: 1/2 cup mayo or Greek yogurt, 2 chipotle chiles in adobo sauce, 1 tablespoon lime juice. Mix until well combined. 0 Response to "15-MINUTE SPICY FISH TACOS WITH SLAW"